Just take a look at some of the hot movers in the under-$10 complex from Thursday, including Zoom Technologies (ZOOM), which is skyrocketing higher by 23%; Mandalay Digital Group (MNDL), which is soaring higher by 13%; Codexis (CDXS, which is ripping higher by 9%; and Lucas Energy (LEI, which is spiking higher by 8.5%. You don't even have to catch the entire move in lower-priced stocks such as these to make outsized returns when trading. One low-priced stock that recently skyrocketed higher after I featured it was pharmaceutical retailer and distributor China Jo Jo Drugstores (CJJD - Get Report), which I highlighted in Jan. 10's "5 Stocks Under $10 Set to Soar" at $1.13 per share. I mentioned in that piece that shares of China Jo Jo Drugstores had been uptrending over the last month and change, with the stock moving higher from its low of 65 cents per share to its recent high of $1.18 a share. That uptrend was quickly pushing shares of CJJD within range of triggering a big breakout trade above some near-term overhead resistance levels at $1.18 a share to some past overhead resistance levels at $1.21 to $1.32 a share. Guess what happened? Shares of China Jo Jo Drugstores didn't wait long to trigger that breakout, since the stock exploded higher on the same day my article hit the wires. This stock tagged an intraday high on January 10 of $1.90 a share and the volume during that trading session was 2.25 million shares versus its three-month average volume of 147,687 shares. That represents a monster gain of close to 70% in just one trading session for anyone who bought the stock has volume started to pour in and anticipated the breakout. Shares of CJJD might be ready to breakout again if the stock can take out some near-term overhead resistance at $1.50 with strong upside volume. >>Should You Invest in the Government's 5 Favorite Stocks? 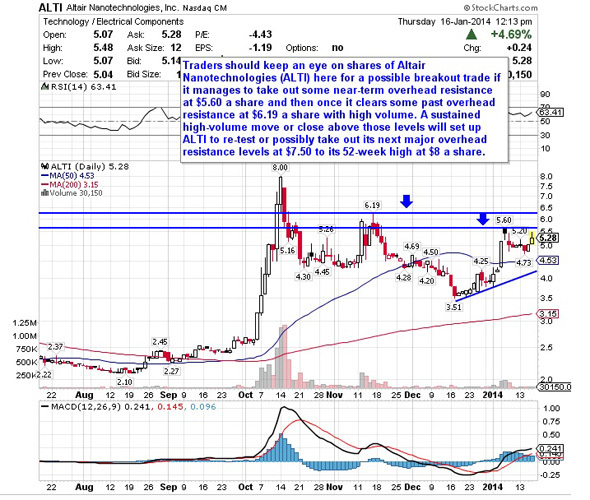 One under-$10 technology player that's starting to move within range of triggering a major breakout trade is Altair Nanotechnologies (ALTI, which develops, manufactures and sells nano lithium titanate batteries and energy storage systems primarily in the U.S. and China. This stock has been on fire over the last six months, with shares up a whopping 128%. If you take a look at the chart for Altair Nanotechnologies, you'll notice that this stock has started to flirt with a near-term breakout trade today, after shares briefly traded above some resistance at $5.20 a share. That spike is starting to push shares of ALTI within range of triggering an even bigger breakout trade above some key near-term and past overhead resistance levels. Traders should now look for long-biased trades in ALTI if it manages to break out above some near-term overhead resistance at $5.60 a share and then once it clears some past overhead resistance at $6.19 a share with high volume. Look for a sustained move or close above those levels with volume that hits near or above its three-month average volume of 66,298 shares. If that breakout triggers soon, then ALTI will set up to re-test or possibly take out its next major overhead resistance levels at $7.50 to its 52-week high at $8 a share. Traders can look to buy ALTI off any weakness to anticipate that breakout and simply use a stop that sits right below some key near-term support levels at $4.73 a share or just below its 50-day moving average of $4.53 a share. One can also buy ALTI off strength once it starts to take out those breakout levels with volume and then simply use a stop that sits a comfortable percentage from your entry point. 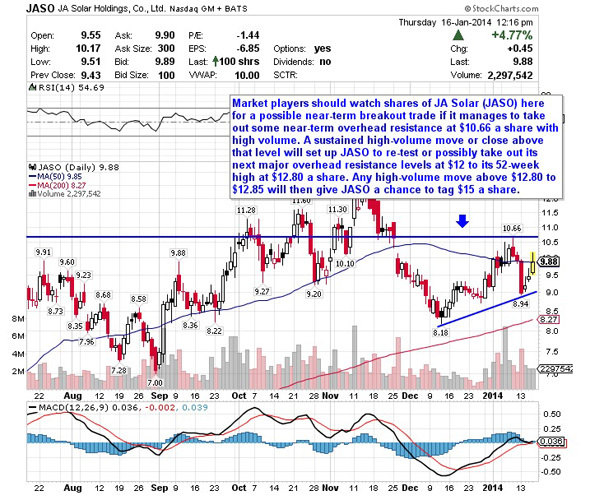 Another under-$10 solar player that's starting to move within range of triggering a near-term breakout trade is JA Solar (JASO, which through its subsidiaries, engages in the design, development, production, marketing and sale of solar power products based on crystalline silicon technologies. This stock has trended modestly higher over the last six months, with shares moving up by 11%. If you take a look at the chart for JA Solar, you'll notice that this stock has started to spike higher here back above its 50-day moving average of $9.85 share with solid upside volume. Volume so far in Thursday's trading session has hit 2.12 million shares, which is just below its three-month average action of 2.57 million shares. This spike is starting to move shares of JASO within range of triggering a near-term breakout trade. Market players should now look for long-biased trades in JASO if it manages to break out above some near-term overhead resistance at $10.66 a share with high volume. Look for a sustained move or close above that level with volume that hits near or above its three-month average action of 2.57 million shares. If that breakout hits soon, then JASO will set up to re-test or possibly take out its next major overhead resistance levels at $12 to its 52-week high at $12.80 a share. Any high-volume move above $12.80 to $12.85 will then give JASO a chance to tag $15 a share. Traders can look to buy JASO off any weakness to anticipate that breakout and simply use a stop that sits around some key near-term support at $8.94 a share. One can also buy JASO off strength once it starts to clear $10.66 a share with volume and then simply use a stop that sits a comfortable percentage from your entry point. One under-$10 health care player that's quickly moving within range of triggering a major breakout trade is Dehaier Medical Systems (DHRM, which, through its subsidiaries, develops and distributes medical devices and sleep respiratory and oxygen therapy products in the People's Republic of China. This stock has been red hot over the last six months, with shares up a whopping 141%. If you take a look at the chart for Dehaier Medical Systems, you'll notice that this stock has been uptrending strong over the last three months and change, with shares moving higher from its low of $2 a share to its recent high of $4.80 a share. During that uptrend, shares of DHRM have been consistently making higher lows and higher highs, which is bullish technical price action. 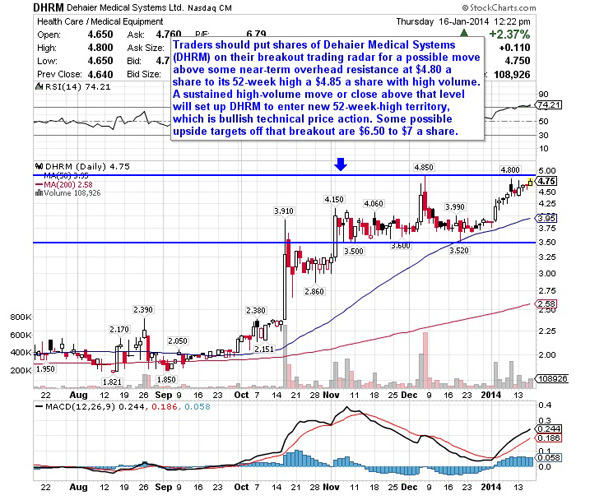 That move has now pushed shares of DHRM within range of triggering a major breakout trade. Traders should now look for long-biased trades in DHRM if it manages to break out above some near-term overhead resistance at $4.80 a share to its 52-week high a $4.85 a share with high volume. Look for a sustained move or close above that level with volume that hits near or above its three-month average volume of 104,479 shares. If that breakout triggers soon, then DHRM will set up to enter new 52-week-high territory, which is bullish technical price action. 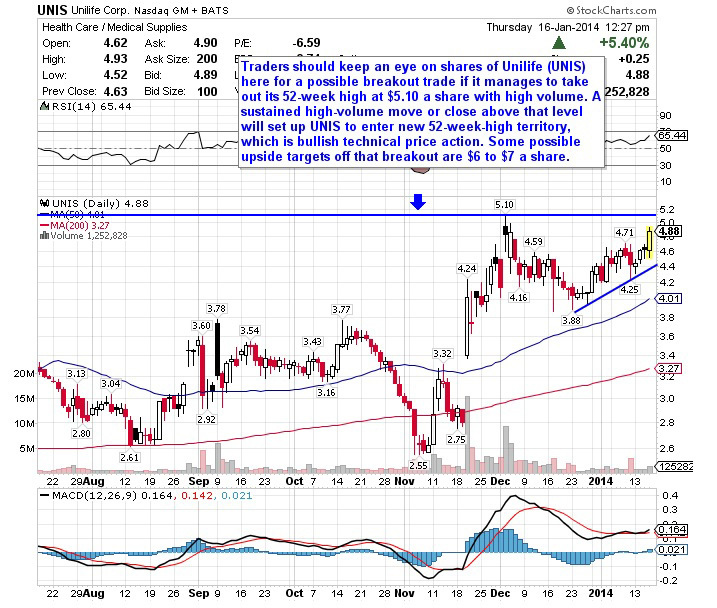 Some possible upside targets off that breakout are $6.50 to $7 a share. Traders can look to buy DHRM off weakness to anticipate that breakout and simply use a stop that sits just below some key near-term support levels at $4.25 a share or around its 50-day moving average at $3.95 a share. One can also buy DHRM off strength once it starts to take out those breakout levels with volume and then simply use a stop that sits a comfortable percentage from your entry point. Another under-$10 stock that's starting to trend within range of triggering a big breakout trade is Oxygen Biotherapeutics (OXBT, a development-stage company, engages in developing biotechnology products that deliver oxygen to target tissues in the body primarily in the U.S. This stock has been in play with the bulls over the last six months, with shares up huge by 127%. If you take a look at the chart for Oxygen Biotherapeutics you'll notice that this stock has been uptrending strong over the last month, with shares moving higher from its low of $4.20 to its recent high of $8.58 a share. During that uptrend, shares OXBT have been consistently making higher lows and higher highs, which is bullish technical price action. That move has now pushed shares of OXBT within range of triggering a big breakout trade above some key near-term overhead resistance levels. Market players should now look for long-biased trades in OXBT if it manages to break out above some near-term overhead resistance levels at $7.25 to $8.58 a share with high volume. Look for a sustained move or close above those levels with volume that hits near or above its three-month average action of 147,898 shares. If that breakout hits soon, then OXBT will set up to re-test or possibly take out its next major overhead resistance levels at $11.40 to $13 a share. Traders can look to buy OXBT off weakness to anticipate that breakout and simply use a stop that sits just below its 50-day moving average of $5.79 a share. One can also buy OXBT off strength once it starts to clear those breakout levels with volume and then simply use a stop that sits a comfortable percentage from your entry point. One final under-$10 healthcare player that's quickly moving within range of triggering a major breakout trade is Unilife (UNIS, which designs, develops, manufactures, and commercializes injectable drug delivery systems in the U.S. and internationally. This stock has been trending strong over the last six months, with shares up sharply by 49%. If you take a look at the chart for Unilife, you'll notice that this stock has broken out here and taken out some near-term overhead resistance at $4.71 a share with decent upside volume. This move is quickly pushing shares of UNIS within range of triggering an even bigger breakout trade above some key near-term overhead resistance. Traders should now look for long-biased trades in UNIS if it manages to break out above its 52-week high at $5.10 a share with high volume. Look for a sustained move or close above that level with volume that hits near or above its three-month average action of 1.87 million shares. If that breakout hits soon, then UNIS will set up to enter new 52-week-high territory, which is bullish technical price action. 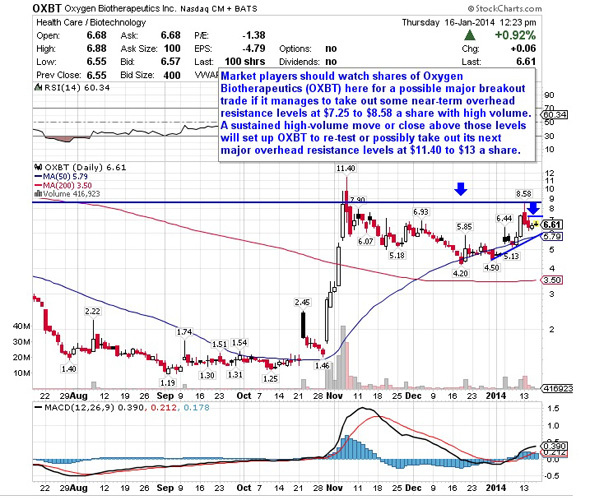 Some possible upside targets off that breakout are $6 to $7 a share. Traders can look to buy UNIS off weakness to anticipate that breakout and simply use a stop that sits right below some near-term support at $4.25 a share or around its 50-day moving average of $4.01 a share. One can also buy UNIS off strength once it starts to take out $5.10 a share with volume and then simply use a stop that sits a comfortable percentage from your entry point.